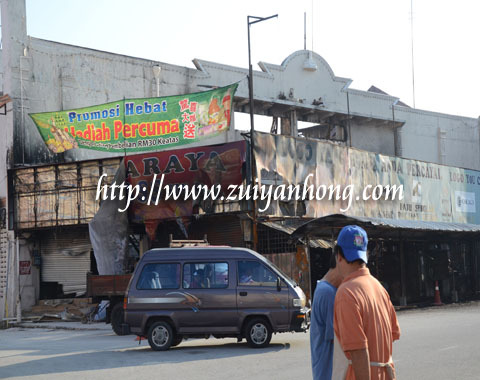 Former Lido Cinema was razed to the ground recently in Malacca. The ruthless flame raged at midnight. The whole building was ruined just in a moment. As the movie industry declined in 1980s, the theater had turned into Lai Lai Emporium. Later it changed again as Khelass Supermarket. 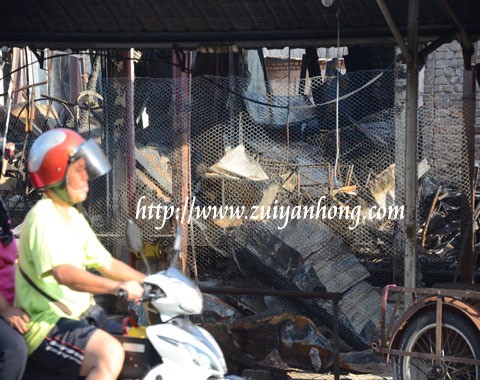 The fire also destroyed more than 10 food stalls, fruit stalls and Mamak stalls outside Kheless Supermarket. Lido Cinema is located at Kee Ann Road. It was a popular hangout spot among the moviegoers before converting into a shopping mall for decades. I believe that the younger generation doesn't know the shopping center formerly was a theatre. Hong Kong Shaw Brothers (Movie Production Company) owned several cinemas in Malacca during last century. In those years, new movie was screened in Rex Cinema, Federal Cinema and then in Lido Cinema. Finally the same movie would be shown in Sun Cinema and Central Cinema. At that time the ticket prices of the front seat are: Sun Cinema and Central Cinema is RM 0.40, Rex Cinema, Lido Cinema and Federal Cinema is RM 0.65. Time flies and things change. The cinemas of those years are gone, you have to visit cinema in large shopping mall and the ticket prices are extremely expensive.